LeBron James made a running hook shot with a second left and scored 26 points, giving the Cleveland Cavaliers a 90-88 victory over the Brooklyn Nets on Saturday night. After Joe Johnson's three foul shots tied the game with 15.2 seconds left, the Cavaliers called timeout and took the ball at midcourt. James took the inbounds pass, dribbled to the top of the key before cutting to the right of the lane and hitting a hook shot over Brook Lopez, the Nets' 7-foot center. James scored 10 points and added a key steal late in the game to help Cleveland (13-4) remain unbeaten at home in nine games. Kevin Love also scored 26 points for Cleveland, which played a sluggish first half and didn't take its first lead until midway though the third quarter. 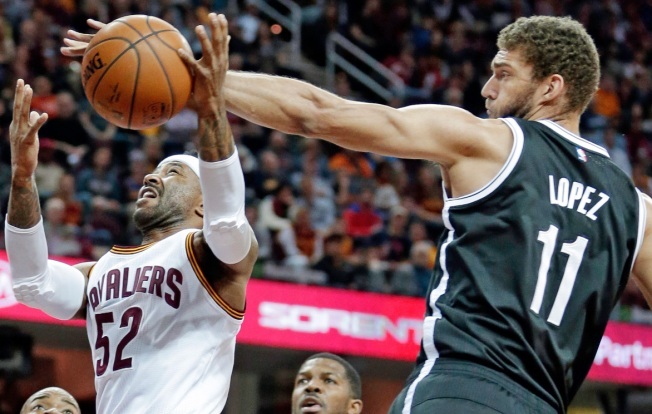 Lopez led Brooklyn (4-12) with 22 points. Johnson added 17 for the Nets, who fell to 1-10 on the road.